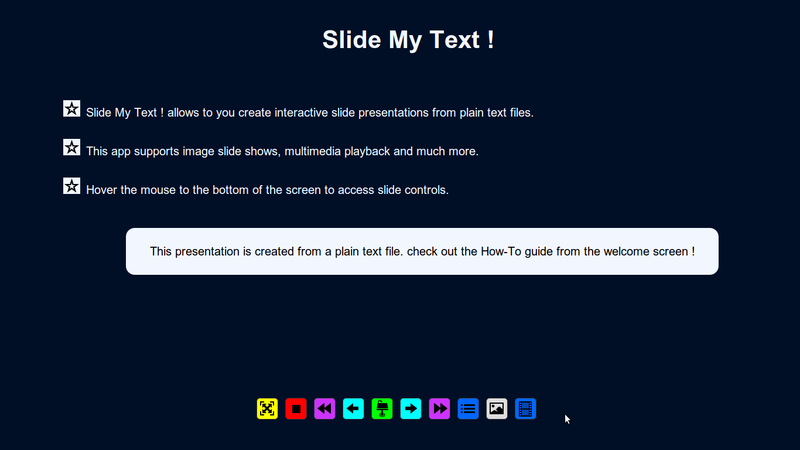 Plain text files ==> Slide presentations ! Slide My Text ! allows to you create slide presentations from plain text files. Plain text files are files with extensions as '.txt' and MIME type 'text/plain'. Since plain text files are ubiquitous and light weight to deal with across different OS platforms, one can just type in their plain text files and drop into this app in the browser. 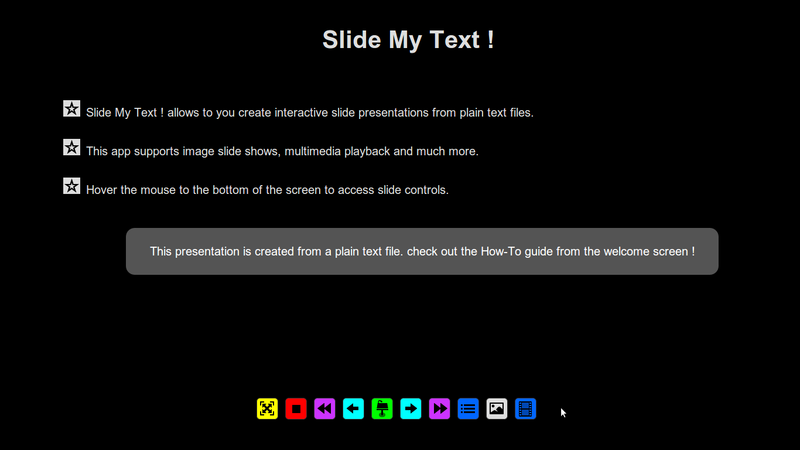 The text file content will be converted into a slide presentation with a lot of cool features including image slide show and multimedia file playback during presentation. Slide My Text ! 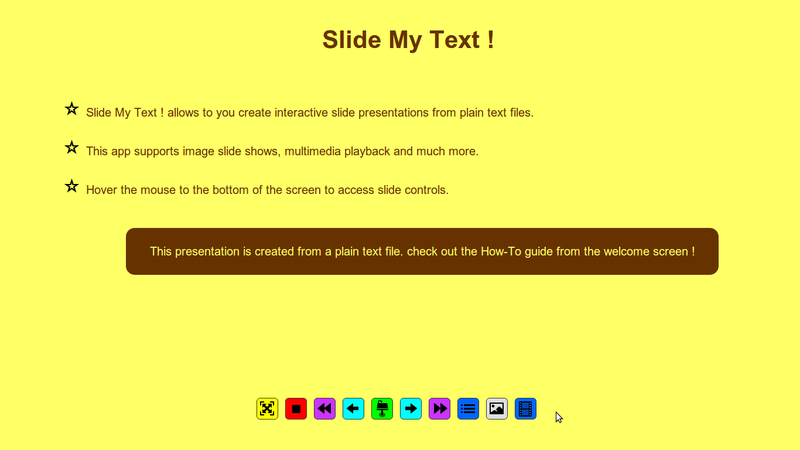 uses lightweight formatting to create slides from text files. A new slide is created by drawing a new line with 4 or more * (asterisks) or - (hyphens), like this: ******************* That's it ! a new slide is now created. Whatever is typed after this line is a part of a new slide. One does not have to be precise about the number of asterisks or hyphens. You can draw as long as you like. It just have to be 4 or more. Mixing of asterisks and hyphens are also allowed as long as total is more than 4. One or more blank lines creates a new slide point. One or more blank lines like this creates a new point. Again one can format the text file with as much blank lines/empty new lines as one likes. It just have to be more than one blank line. One can be liberal with their white spaces and blank lines in their text files. For example ************************************** * new slide ! * this still marks the beginning of a new slide with the title 'new slide !' even though there are multiple spaces infront of the line and within the title string. - slide points can have any number of spaces before them. It will still be a new slide point. For example, this will still be a bullet point even though there are spaces between the hyphen and the point. Same applies for highlight points too.